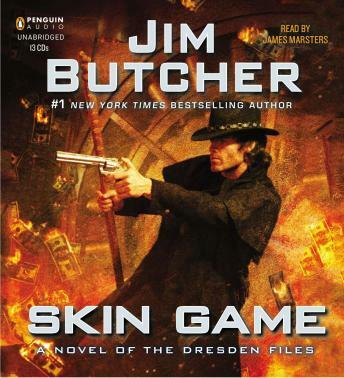 I have read 3 of the Dresden Files books via audio book now. Marsters is an amazing reader. I finished another book sample where I could not stand the narrator, and began this one within minutes and was instantly at ease with his reading style. Skin Game isn't my favorite of the DF books, but it's not my least favorite either. I really enjoyed the fast pace and surprises. I said, "what?!" out loud several times. Any Dresden fan will love this book and it's narrator. This is my first audiobook and I have to say I absolutely loved it. The narrator was able to capture the emotions perfectly and of course the Dresden files are great books to begin with. I highly recommend the entire Dresden series. Alsome book it was fun, action-packed and exciting. Can't wait to hear more. I love the dresden files. From Storm front, which i found a little slow, to skin game. They just keep getting faster and better. I get them in hard back, and read in no time, and then i have to wait another yr or more, til the next one. But Skin Game is great, Harry is devoleping into a strong character. Jim Butcher has become one of my favorite authors, he ranks up there with Raymond E. Feist, & David Eddings, as one of my most favorite authors. Love James Marsters, as our great narrator. Keep it up people. Oh yeah, when is the next Harry tale. This is one of the best Dresden Files books yet! As always, James Marsters is a very talented man who reads the book masterfully and Jim Butcher continues to amaze with his writing skills and creativity. These books work well as stand alone books, so if you haven't read the rest of the series don't let that deter you from reading this book. I do feel I must add a warning, though. The Dresden Files books are addictive! I'm already on my third time through this book and I have had it less than a week. As for the rest of the series, I have been through it at least six times and I notice new details every time I hear each book. Thank you, Audiobooks.com! !